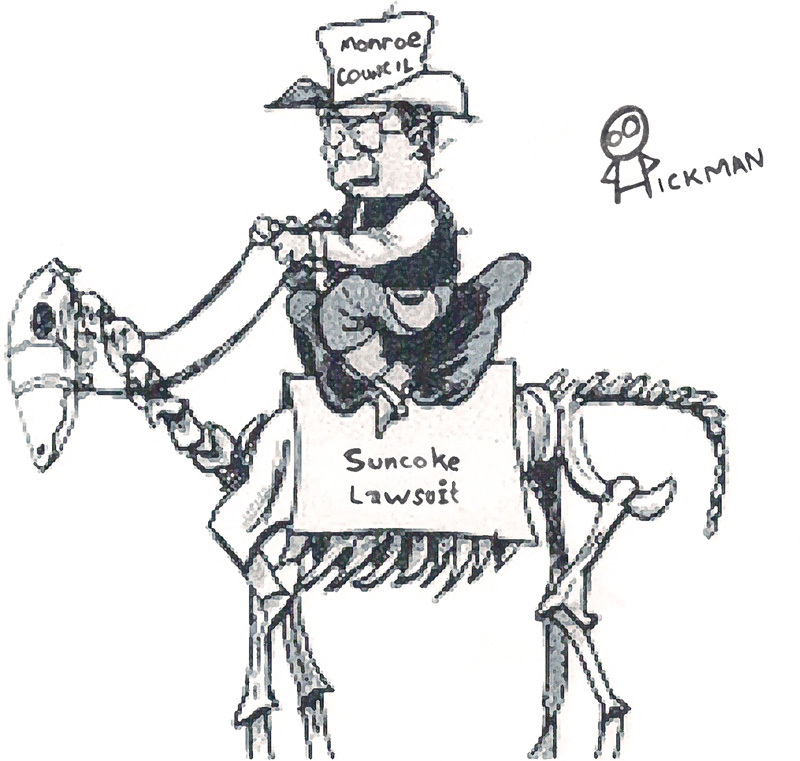 Editorial: Continuing the SunCoke Lawsuit is like riding a million dollar dead horse to nowhere. Councilman Hickman won't ride that horse. Council voted on Emergency Resolution 14-2011, a resolution to authorize our attorneys to file an appeal to the SunCoke ruling. That vote went six to one with the lone dissenting vote coming from Todd Hickman. Former Monroe Council candidate Bob Bretland had this to say about the appeal, "the definition of insanity (or unwise spending) is repeating the same process over and over and expecting a different result. At least 1 council member sees the reality and voted NO." I believe Hickman will have a rather large voting block if he runs for re-election. Hickman won't have to campaign again if he keeps up his emphasis on controlling spending (re: SunCoke, I75 Interchange), and improving communication (re: Hickman called for more detail in the Council Action Summary). The unintended consequence of this SunCoke lawsuit is that it makes Monroe less appealing. This is due in part to our attorneys painting the future of Monroe as being excessively polluted and Monroe being less than business friendly. Painting a future polluted Monroe is no way to attract new businesses and residents. Everyday this lawsuit continues Monroe becomes more damaged in the business community eyes and the Monroe taxpayers pockets. Businesses such as Chipolte refuse to give a start date and no other restaurant business has committed to coming to Monroe, yet. With this lawsuit looming and the question about Monroe being a good location for an investment, I think the business community is being prudent to wait till the dust settles. We have a budget crisis which can only be resolved with budget cuts. Our greatest assets and costs are police and fire. Each dollar we spend on SunCoke, will take a dollar out of our budget. That means instead of laying off one or two police and firemen, we will have to lay off three, four or five. So not only will Monroe be polluted beyond belief, we also won't be as safe. We only have so much money, Today the General Fund has $5 Million by 2014 Monroe will have only about $100K in the General Fund. Monroe started running deficit spending the first day of 2011. This projection doesn't even take into account additional SunCoke spending. Further we risk losing again and having to pay court costs of the defendant. It comes down to this, spend on Police and Fire or spend on SunCoke, but you can't spend on both. Newly appointed Monroe Councilman Steve Black has this to say about the Suncoke Appeal and more Monroe Spending, "...it's overall frustration with the entire thing. I absolutely detest everything about this situation between the city and Suncoke. I can't stand the process, I can't stand how it's diverting my attention from other things, I hate the division it's created, but the one thing that I can't stand the most is my inability to explain things." I say this in response to Councilman Black, "Soon when you understand that Monroe will be having financial difficulties for a second time in two decades, then you may change your mind. If you move to an understanding that you are not spending your money, you are spending money that does not belong to you, then you may just spend it more wisely. [Recommended: Friedman Explains Spending]." Monroe could spend $20 Million and still lose this unwinable lawsuit. This lawsuit puts Monroe at odds with the Governor of Ohio, the County of Butler, our neighbors, even the president of the United States will add the economic value of SunCoke in his budget forecasts and financial accomplishments. Suncoke has obtained all the necessary permits, the judge rulled in favor of Suncoke because the permits are legal. Fighting this fight is a waste of taxpayer money. Dannyboy posts, "If the plant will be done in 2011 and the permit appeals won't be heard until 2012 (or later), isn't there a roughly 0.1% chance of the appeals being successful? The Environmental Review Appeals Commission and/or the Franklin County Court of Appeals is going to shut down a completed plant after years of permit approvals by OEPA? Really? Has that ever happened before?" Monroe is hurting the potential livelyhood of many Monroe taxpayers. For the people who live in Monroe for over 20 years, AK has touched nearly every resident either their father, mother, brother, sister, uncle, aunt or cousin worked for AK. A Healthy AK means a more econmically viable Monroe resident tax base. If AK Steel decides that it is too expensive to work in Middletown, they will close the plant down. Herein lies the secret wish of at least two Monroe councilmen. If you are an active member of SunCokeWatch and the Sierra Club, you are actively trying to get AK to move. As poster Houndog puts it, "When America stops producing steel, stick out your right ankle and allow them to shackle you to a sewing machine. That way you can spend eighteen hours a day cranking out sweat pants and tennis shoes for some nation that can still afford such luxuries." Les Lofton posts, and I agree, "I believe the damage that Suncoke will cause has been way overblown, that the money to fight it was a waste, and that council kowtowed to a group of vocal citizens. The blighted areas around AK weren't caused by air pollution. They are just like many other aging lower-income areas in this country." "The City and Suncoke Watch have failed in their attempts to keep the plant from being built. It's built." - Bob Bretland. SunCoke Watch Failed Us due to a lack of conviction. What ever happened to that group? Seems that there is no activity from the group at all. It's almost as if they already succeeded in getting Monroe to spend millions on their initiative. Even with all that money spent on the group, did we hear thanks Monroe for spending your tax money? I haven't heard one. I've heard them thank council as if it was their money to spend. But no thanks to the Monroe community. At least they could say that on their website. HarperValleyRez says, "Suncoke is not going away. I've actually talked to many of the guys who are here working to get it running. They are among the supervisors and plant planners/engineers at this location. Many have participated in the building and rehabbing of other facilities. They've shared the fact that their corporate lawyers, admins, etc have complied with all required EPA codes." All SunCokeWatch did was force Suncoke to reduce the power production to less than 50 Mega-watts from 57 as planned. By reducing power consumption, additional permitting was not required. So Monroe's actions is redirecting this lost electricty to other electric plants who will burn more coal to fill the void. Basically this effort will cause the exporting of extra polution to other areas and at a higher cost than if SunCoke was allowed to product their full electrical capacity. This should put SunCokeWatch at odds with the Sierra Club. More pollution because of SunCokeWatch's threats to council and SunCoke. HornetPride posts, " If you put it to a vote we wouldn't have a lawsuit in the first place. The new guy was selected by the majority of those in power and then he votes with council. Hard to believe, isn't it." Spending millions of dollars in taxpayer money when Monroe is projecting deficit spending starting this year to the point that by 2014 the general funds are fully depleted is not a responsible way to run the city finances. Further spending ought to be put to a ballot, but that will never happen. If we put the Suncoke appeal on the ballot, and the appeal lost, so would every council member whose term ends this year. Political suicide is not something any councilperson wants. But what of the will of the people? You can't find out by only asking the folks who live next to the SunCoke facility.